Trash is everywhere here. People throw it down without the least bit of embarrassment — on the streets, on the sidewalks, along the rocky paths, it is found in fields and stuffed in every crack and crevice. 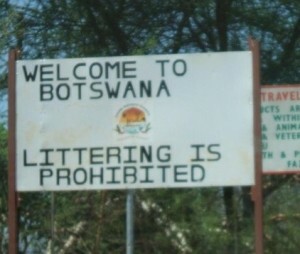 When we first came to Botswana I was a little shocked at how much litter there was here. I couldn’t, and still don’t understand why the people would want to mess up their beautiful countryside with all this trash. We have traveled around the country a bit, and the problem is the same everywhere. I am somewhat used to it by now, but wherever I look, the trash is still there. 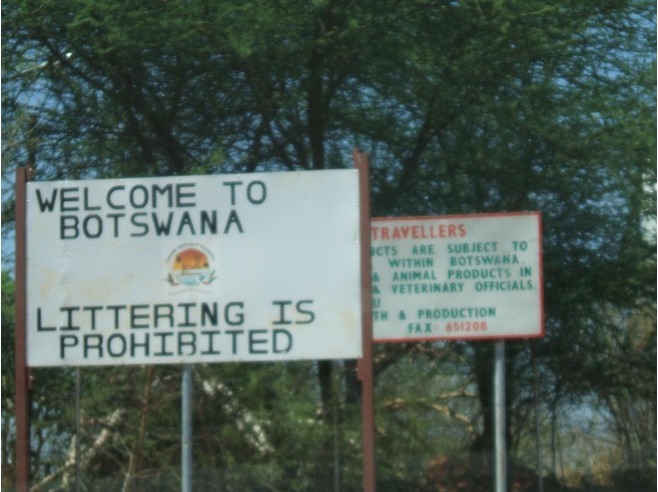 I know that this is not a problem unique to Botswana. While some countries are known for doing their civic duty in regard to throwing trash where it belongs; many are not. When we were nominated to serve in the Peace Corps it was to serve in Eastern Europe. Based on the date we were to leave, and the jobs we were nominated for, we were sure that we would end up in Albania (boy were we wrong). So I looked into Albania, researched the country, and read blogs of Peace Corps Volunteers serving there. Apparently, Albania has a terrible problem with litter as well, probably worse than Botswana. In fact, many developing nations are pretty casual about their garbage. I am realizing that as countries develop and grow, some parts grow faster than others. Development of infrastructure, the marketplace, and habits of the citizens don’t move forward evenly. 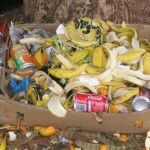 The demand for fast-food and processed foods, wrapped in cardboard, paper, and plastic, and aluminum soft drink cans grows faster than the government can, or more accurately, is willing to create landfills. It is more popular for politicians to spend the money on college tuition and paved roads than garbage trucks and public refuse containers. In the USA there are trash cans on every corner and in front of every store. They are everywhere. So many, in fact, that you don’t even take notice. When a Motswana walks out of the store heading home with a soft drink in his hand, he or she knows that when the can is empty he will have a choice. 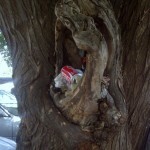 If he chooses to discard of it properly, he will have a problem — there are not enough refuse cans in the public areas. There are a few, but they are scarce, and the ones you find will probably be full to overflowing. So in Botswana, even if he wants to do the right thing, it is not easy. Some people do try to do the right thing, and look for a receptacle of some kind, any kind, to hide their trash in. If a box is laying on the ground, they will put their trash inside the box. But just as often you will see trash thrown on the ground within ten feet of a perfectly good trash bin. It must be illegal to litter based on the road sign I saw recently, though that law is ignored completely. I suspect there is also a legal requirement for companies to discard of their trash correctly and many will have large trash bins in the back. In an effort to keep the citizenry from dumping its trash in the company trash bin, they often protect it with wire on all sides, even above. I paid 200 pula for the district council to provide me with a trash can and empty it for two years. Two years trash pickup for the equivalent of $25 — not bad. Not bad at all, except for the fact that they don’t empty the trash when they are supposed to. I have had to go to the council office and inquire about my trash to get it picked up the three times it has been picked up since September. 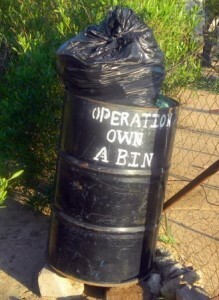 At least it is getting done, and I am not contributing to the accumulation of trash in Botswana. 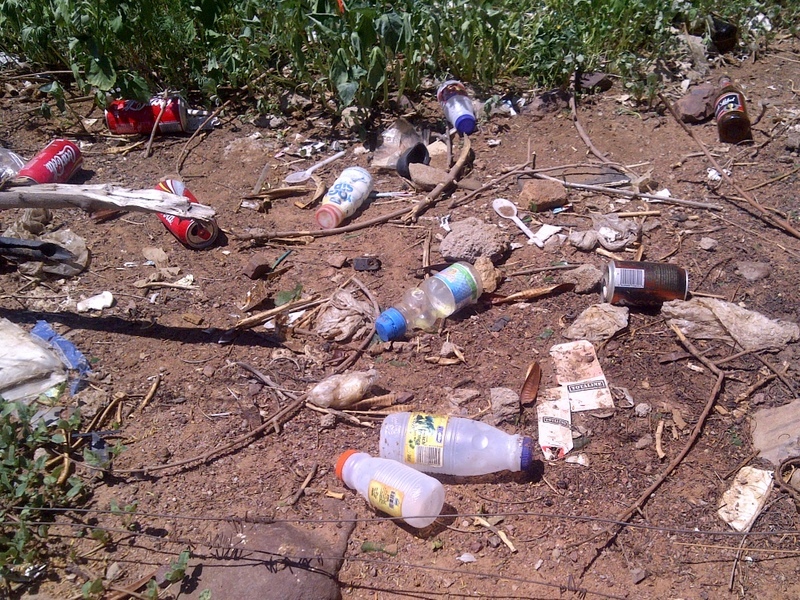 So as we walk around Mochudi, our home, we walk by trash everywhere. Interesting fact: I notice that the longer I am here the less I notice it. It barely attracts my attention anymore, which is a good and a bad thing. It is good in that I see the beauty of the country and am less distracted by the banana peels, candy wrappers, take away boxes, and coke cans at my feet. But it is a bad thing because I suspect that not noticing is part of the problem. The people of the country probably don’t notice it as well, and so are not offended and moved to take action. This entry was posted in Peace Corps, Service - Year 1 and tagged africa, Botswana, litter, Mobley, Peace Corps. Bookmark the permalink. I think the fact that we do it here in the states is a statement to the “Keep America Beautiful” campaign that Lady Bird Johnson started years ago and continues today. 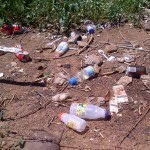 Interesting topic and a shame that there is so much litter in B-wana. I’ll be sure to throw away my trash properly when we get there.